The Islamic State of Iraq and al-Sham (ISIS), formerly known as al-Qaeda in Iraq (AQI), recently condemned Iraq’s upcoming national elections by disseminating official messages in Kirkuk, Diyala, Ninewa, and Northern Baghdad. ISIS conveyed these messages in March 2014 through leaflets in northern Baghdad and Twitter pages dedicated to its Wilayats (States) the ‘ISIS Wilayat Diyala,’ the ‘ISIS Wilayat Kirkuk,’ 'ISIS Wilayat Ninewa', and the ‘ISIS Wilayat Northern Baghdad.’ Until April 30, 2014, when Iraq’s national elections are scheduled to take place, ISIS should be considered a direct threat to electoral candidates, election centers, and voters in these locations. The threat to elections posed by ISIS is not without precedent. AQI also attempted to derail political process before national elections in 2010; however the present context is critical. The ability of ISIS to cause security conditions in multiple provinces to deteriorate to the point that elections centers cannot open, or that Iraqis cannot safely register for voter cards, has the potential to jeopardize electoral process. At an operational level, ISIS may intend to destabilize Iraq by disrupting elections. At a strategic level, ISIS may consider the failure of elections as a victory against democracy. Without free and fair elections, Iraq’s political institutions may not be able to withstand pressure from anti-government groups. Iraq’s stability therefore depends upon successful elections on April 30, 2014. Until that date, ISW will report on observed security threats to the elections. This report contains full translations of the March 3, 2014 statements condemning elections posted to the Twitter pages of ISIS Wilayat Diyala, ISIS Wilayat Kirkuk, and ISIS Wilayat Ninewa. Images of the distribution of anti-election leaflets distributed in Northern Baghdad are also included, as posted to the Twitter page of the ISIS Wilayat Northern Baghdad. The existence of these Twitter pages, as well as the consistency of their message content, confirms the intent of ISIS to establish alternate governance structures inside of Iraq. Wilayats are governorates within the broader construct of the Islamic State of Iraq and Sham (ISIS), and they also historically subdivided the Islamic State of Iraq (ISI). ISIS Wilayats have also been observed in Anbar, Salah ad Din, Ninewa, and the South, likely referring to northern Babel. ISIS Wilayats are also present in Syria. It is therefore important to note that ISIS is not operating solely as a military organization in Iraq. ISIS seeks to gain legitimacy relative to the government of Iraq through religious authority as well as hard power. 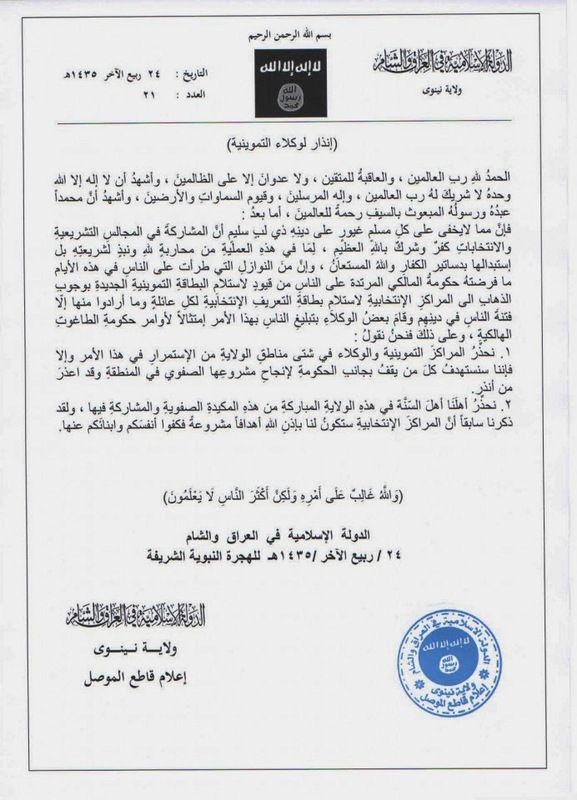 In Kirkuk province, a statement dated March 3, 2014 was released by the Sharia Commission of the Islamic State in Iraq and Sham [ISIS] in Wilayat Kirkuk regarding the participation and facilitation of the upcoming elections. The statement, along with other anti-elections leaflets, were distributed students in at least one school and to citizens elsewhere in Kirkuk. The statement claimed that participation in the elections is Kufr, or a concealment of Islamic truth, for replacing “God laws” with the laws of “infidels.” The statement also declared polling centers and centers used to distribute the Voter Card, (electronic cards planned to be used by voters on the day of the elections) as targets and warned “Sunni” citizens from going near them. An image and full translation of the official statement posted to the ISIS Wilayat Kirkuk Twitter page is provided below. All the glory and thanks to Allah who set the rules for his followers, the rules that should keep them living happily and peacefully in this life under the justice of just and fair rulers, in a perfect world where there should be no powerful-unjust men nor there are victims. May God also bless the spirit of his glory messenger to us, Mohammed [P(eace) B(e) U(pon) H(im)]. [Translator’s Note: In this section the letter quotes a verse from Quran (Shura 21) which implies that Muslims should not set laws that have no roots in Sharia law]. All Muslims know the following fact; participating in elections is severely prohibited in Islam, because this process replaces the laws of Shari’a, which are the laws of Allah, with laws that are manmade, furthermore, those laws are created by the infidels themselves. The Rafidhi government in Baghdad has forced our Muslim people to obtain the electoral-smart card by linking those smart cards to the food rations’ supplies for each family, which is a cowardly way that aims to swerve our people from the path of God. Because of the above; we warn the owners of the food rations’ centers in this state [Kirkuk] from processing any of those so called “the voter’s card” [same as the smart-card mentioned above] or else! We also ask our Sunni people in this glorious state [Kirkuk] to not fall victims to the plans of this Safavid and Rafidhi government. And as a friendly reminder; we have previously warned everyone that electoral-centers will be targeted during elections’ days. Thus, we again remind you to stay far as possible from those centers. 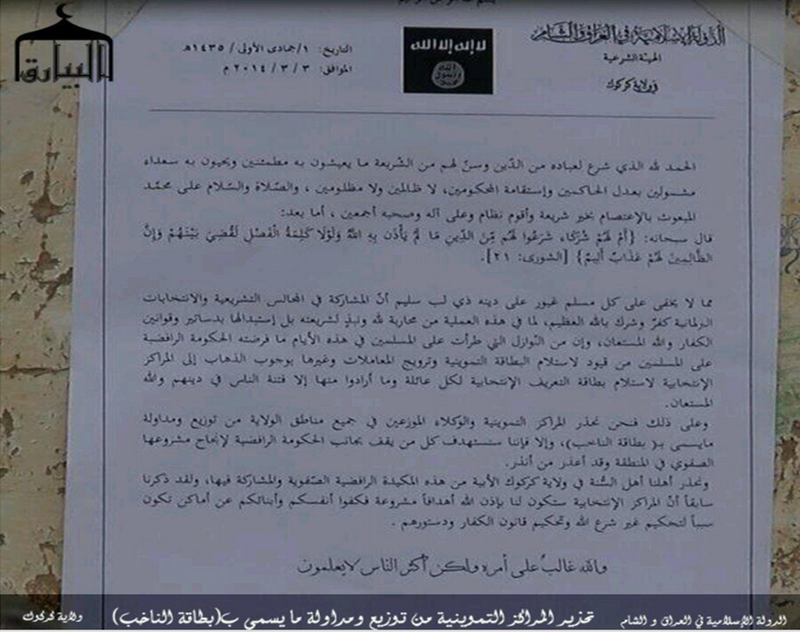 Another statement was released by ISIS in Diyala on March, 2014, the same month. The statement again described the elections and the representation of citizens in the parliament as Kufr since they replace Gods laws. The statement added that selecting a candidate from any background is Kufr and that the candidates and the voters, are both equally Kafirs and “Infidels.” The statement warned the Sunni people from participating in the elections, declaring them as targets if they do participate. It also warned speakers of the mosques from garnering support for the elections. Finally, the statement warned that the electoral centers and locations used to distribute Voter Cards would be targeted. An image and full translation of the official statement posted to the ISIS Wilayat Diyala Twitter page is provided below. All the glory and thanks to Allah who sat the rules for his followers. May God also bless the spirit of his glory messenger to us, Mohammed P(eace) B(e) U(pon) H(im). [Translator’s Note: Here the letter quotes a verse from Quran (Hud 113) which implies that Muslims should not listen to those who lost the path of the goodness]. After a long sequence of failures by those who adopt the electoral process in Iraq, and after Mujahideen have struck those who came with the deceiving “democracy,” the traitors and the small slaves of those in power within this government came up, inspired by the Satan himself, a well thought plan to force Muslims to participate in the upcoming elections. The voter and the candidate are both equally against the Sharia of Allah, and therefore both the voter and the candidate will be equally targeted and punished. What brought people to this mess is their lack of education and information when it comes to Shari’a laws, and not following the clerics who have merit to be followed and have devoted their lives for this purpose, to be well informed so they can inform those who ask and seek knowledge. Muslims should not seek benefits of this life; they should seek the rewards and benefits of the eternal life after death. Maliki’s smart card is no doubt a smart one; it is designed to intimidate you! And you all have gained nothing from Maliki before but mass killing campaigns carried out against you by the dirty hands of his militias. We ask all of the teachers, Mosque Imams and everyone who have audience to warn his audience from participating in elections. Those who participate in elections are infidels, there will be no excuses, in case you did NOT know, you DO know after this warning! Warning to the public: Electoral centers will be high-probability targets for our men. Stay as far as possible. Warning to food rations’ centers’ owners and operators in addition to teachers: promoting the “voter’s card” or encouraging the public to obtain it is an act that is severely punishable by us. An equivalent image of the statement released by the ISIS Wilayat Northern Baghdad was not posted to their Twitter page, though ISIS Wilayat Northern Baghdad released the following photo, illustrating the distribution of anti-election leaflets. Iraq’s national elections have already been jeopardized by the ongoing security crisis in Anbar province. On March 24, 2014, the Anbar local government informed IHEC that elections cannot be held in almost half of Anbar, especially in Fallujah and other surrounding areas since these areas are still mostly under control of ISIS. In addition to fighting, ISIS is now engaging the Sunni populations in Kirkuk, Diyala, Ninewa, and Northern Baghdad in an attempt to dissuade them from electoral participation before launching attacks. The delivery of the leaflets displayed in the images shown above indicates that ISIS is operating overtly in these areas of Iraq, which all have mixed populations. As of yet, the Twitter pages associated with the ISIS Wilayats in Anbar, Salah ad Din, and the South have not indicated involvement in this anti-election messaging campaign. This may indicate that ISIS is most organized and able to project influence in Kirkuk, Diyala, and Northern Baghdad. It may also indicate where ISIS perceives the greatest opportunity to stoke ethnic and sectarian rivalries and mutual violence ahead of elections. It will be important to consider how these messaging strategies relate to ISIS military operations in each area. This will be the subject of ongoing analysis.